The preparations for the Show moved up a gear this week. 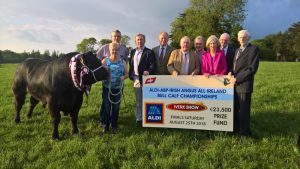 We were in Watergrasshill at the launch of the Aldi-ABP-Irish Angus All Ireland Bull Calf Championships 2018. The total prize fund this year is €23,500. This is probably one of the biggest prize funds for any championship in Europe never mid Ireland. The final of course will be at Iverk on August 25th. We will be delighted to welcome you all back again to Piltown to witness for yourself the quality of animals on show and the standard of showmanship. The launch was held on the Farm of Irish Angus Breeders, Ben and Elaine Ryall. The Minister for Agriculture, Michael Creed performed the launch. We certainly want to thank them for their help and time in promoting this wonderful championship.